We are just FOUR days away from our Studio Party! We are not only flinging open the doors to our studio space for the first time, giving you the chance to meet our team and enjoy a glass of wine and some local fare — but opening all our suitcases to shop our favorite finds from our October trip to Morocco. Here’s a sampling of what you can expect to shop this Friday night (5 to 8 p.m.) and Saturday (10:30 a.m. to 2 p.m.)! Come PARTY with US! We went to Morocco with epic rug expectations -- and a few days into our trip, found ourselves climbing and laughing our way up a literal PILE of gorgeous rugs. It was magical. Each Moroccan studio assigned us an employee who would ask us our color palette and style preference and would pull from these massive piles of all patterns and sizes and weaves, going on the hunt with us. We spend hours scouring piles and piles of rugs, and found that black and white rugs were everywhere -- but good-quality antique colored rugs were tricky to find. Sometimes we’d fall in love with a pattern but as we got close, would see if needed a bit of repair. It was an artistic journey we can’t wait to go on again! EXPECT: At our studio party, expect colorful rugs from reds and pinks to blues and purples as well as a range of black and white rugs from runners to large sizes! One surprise as we shopped the medinas of Morocco was how challenging it was to comeby beautiful poufs. Yes, poufs were everywhere and they looked charming from far away -- but as we got close, they were often matted and poor quality and something we didn’t want to bring back. We scoured the local market places to find the best quality, antique poufs made from Berber rugs -- and brought back a few of our favorites! Also, something we learned is that a rug has to be cut up to create a pouf, which means the good-quality rugs have to be sacrificed to make good quality poufs. It made us appreciate these beauties we are selling all the little more! The leather ones were easy to find and we snatched a black and white leather pouf that we’re in love with! EXPECT: We have a number of multicolored poufs ready for purchase at our Studio Party! In Marrekech, we made a new friend, Habib, when we came across his gorgeous studio. He had a number of round pillows that caught our eye (round is back!) but we weren’t crazy about the textile he used. A few feet over, we see stacks and stacks of black and white mudcloth and indigo textiles, and Habib tells us their pillows can be made custom -- and before we left Morocco. We were ecstatic! Right then and there we forged a friendship over decor and art and textiles and put in a huge order for black and white mudcloth, round pillows. 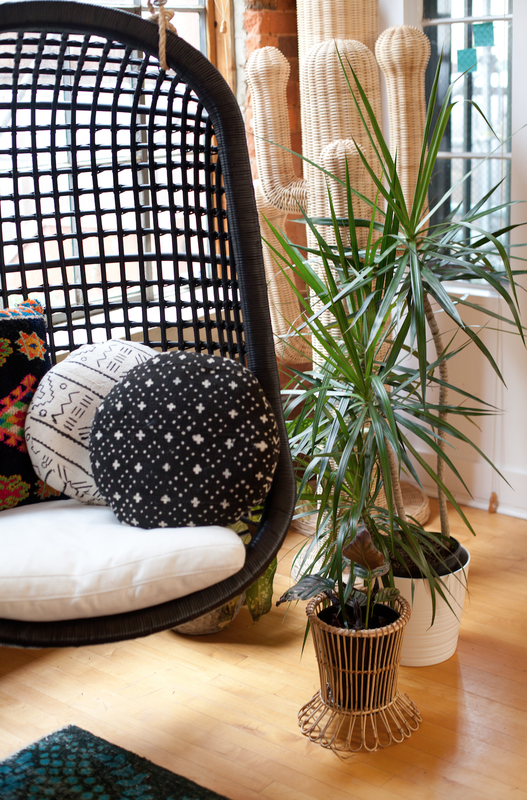 EXPECT: At our Studio Party, expect piles of round, mudcloth pillows ready for purchase! We have black mudcloth, white mudcloth in round sizes -- and custom indigo lumbars for sale. These lidded baskets are all over Morocco and we found them in all colors and sizes -- from black and white to gorgeous magenta stripes. They’re good for any surface and we love the idea of using them this holiday season for bread and added some personality to a tablescape. EXPECT: We have a huge selection of lidded baskets in all sizes and colors, come ready to shop! 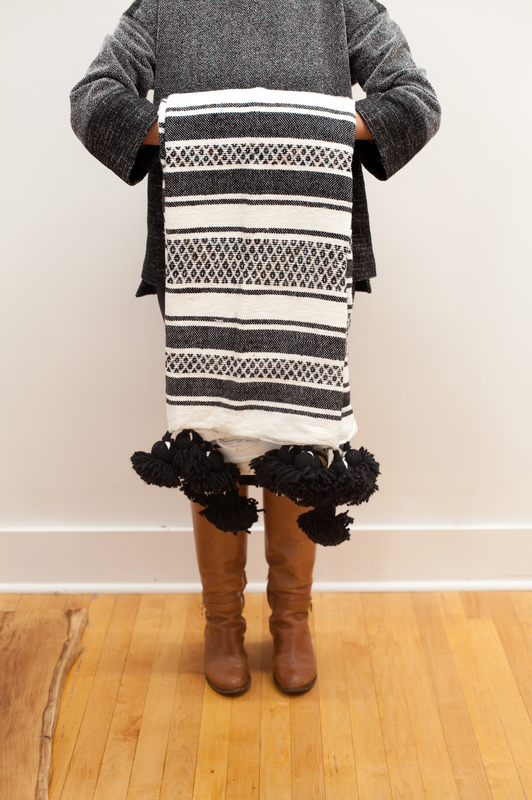 We brought back a number of handmade throws with gorgeous, oversized tassels. They’re the perfect size for king and queen size beds! We fell in love with this black and white striped one -- the tassels add so much texture and personality to a living room or bedroom. EXPECT: Throws like this one in a variety of neutral shades, ready for purchase!